This fabulous raceday fascinator is just one of hundreds of hats, fascinators and hatinators in stock at Simply Devine - the go-to hat shop in the north of England. Simply Devine supplies hats not just all over the UK - but to all corners of the earth! The colours, sizes and prices are second to none with hundreds of items in stock. 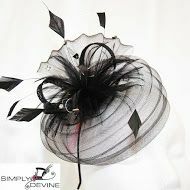 This delightful fascinator features a crin "pill box" creation with beautiful feathers and quills all sitting on a slim,elegant black metal band for maximum comfort and style.